Another wave of storms in the shape of Storm Gertrude is sweeping across these islands, and on a cold, wet and blustery afternoon, three of us went for a late lunch today in Caffé Letterario Gatta Nera in Bray. This authentic Italian literary café is hidden away in Albert Walk, a laneway behind the railway line, just south of the Dart station. The walls are lined with books, many of them in Italian or art books, and with the sleeves of old LP records. It is a small, cosy and welcoming place, and one of Bray’s charming, hidden treasures. Last summer, the owners organised a ‘Sicilian Week’ around their selection of Sicilian wine, including Nero D’Avola, Cerasuolo di Vittoria, Grillo, Cataratto/Chardonnay and Regaleali Bianco. But this is not just a place to eat and drink. The café also organises evenings with live music, readings, and language exchanges to encourage Italian conversation. Next Wednesday [3 February 2016] there is an Italian/English exchange evening, the perfect opportunity for people who want to test, practice or improve their Italian – and for people who simply likes the sound of Italian. One of the most-visited quiet corners of Christ Church Cathedral, Dublin, is the side chapel in the south-east corner where there is a large copy of Andrei Rublev’s icon of the Holy Trinity. Andrei Rublev (Андре́й Рублёв), who is regarded as the greatest mediaeval Russian author of Orthodox icons and frescos, is commemorated today [29 January] in many Church calendars. Tradition says Rublev was born in the 1360s, but we have little information about his life, and we do not know when or where he was born. Rublev died at the Andronikov Monastery in Moscow on this day, 29 January, in 1427or 1430, although some sources give the date of his death as 17 October 1428. 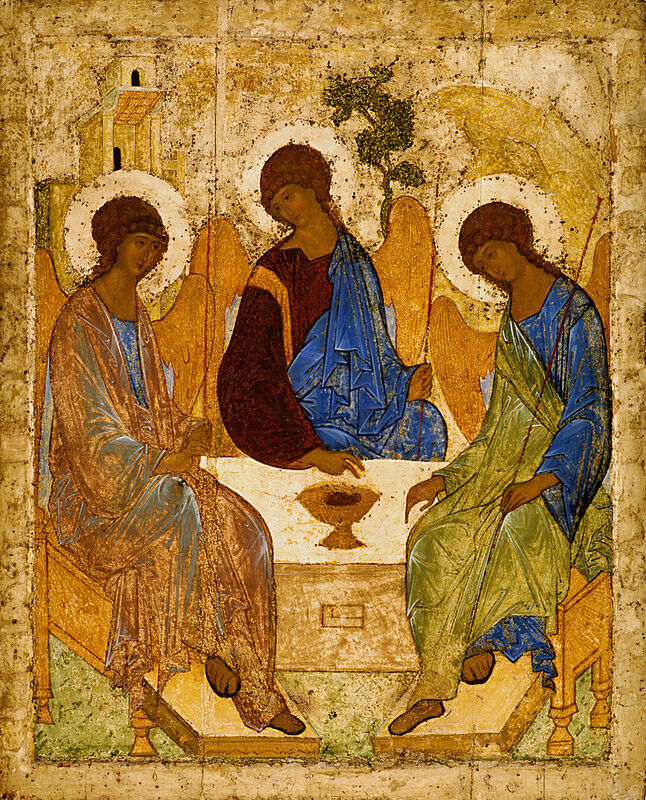 Rublev’s work has influenced many artists and theologians. However, the only work authenticated as entirely his is the icon of the Visitation of Abraham or the Old Testament Trinity. This dates from ca 1410, and is now in the Tretyakov Gallery in Moscow. This icon is based on an earlier icon known as the “Hospitality of Abraham,” based on the story in Genesis 18. Rublev removed the figures of Abraham and Sarah from the scene, and through a subtle use of composition and symbolism changed the subject to focus on the Mystery of the Trinity. Rublev combines two traditions in his work: the highest asceticism and the classic harmony of Byzantine mannerism. His paintings are always characterised by peacefulness and calm. His work is often regarded as the ideal of Eastern Church painting and of Orthodox iconography. Andrei Tarkovsky’s film, Andrei Rublev, made 50 years ago in 1966, is loosely based on his life. This is probably the only film produced in the Soviet era to treat the artist as a major figure in Christian history and as an axiom of Russia’s historical identity. The Russian Orthodox Church canonised Rublev as a saint in 1988, and celebrated his feast day on this day, 29 January. The liturgical calendar of the Episcopal Church (TEC) also commemorates Rublev today.